Planning your island vacation in conjunction with a Caribbean Carnivals, Festivals or Popular Event is always a Win-Win! 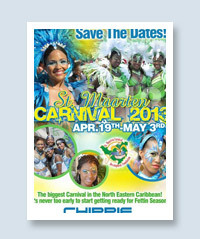 The 10-day celebration is St. Maarten’s largest cultural event. The Dutch Caribbean island features the distinctive culture with colorful parades, spectacular pageants, exciting Calypso bands, and concerts. The "Taste of St Croix"is the event that started it all, and it has now evolved into the Food & Wine Experience. Held at Divi Carina Bay, local restaurants, chefs, farms and caterers provide attendees with a sampling of their delights. International winemakers, rum distilleries and breweries also offer samples of their creations. Visiting celebrity chefs, winemakers and VIPs judge the competition. Other events include Gourmet Vintner Dinner, Food Fight! on the beach, Wine Dinner, Cork & Fork Dinners, Sunset BBQ, Kids Cooking, and Wine in the Warehouse. Headlining this year's festival are Grammy award winners India.Arie, Dionne Warwick and Melanie Fiona, along with rising star, Lianne La Havas. 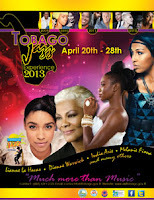 There will also be music performances from Trinidad/Tobago, along with regional talent. The 4th Annual Carriacou Maroon & String Band Music Festival on the island of Grenada offers the ideal way to experience Carriacou’s Maroon culture - which is about thanksgiving and prayers to the source of all life, production and prosperity. Its African origins are authentically depicted through the drumming, singing, eating of ‘smoke food’ and other rituals practiced in the unique Carriacou way by its people. The festival has become an internationally-known event bringing together international as well as local musicians. 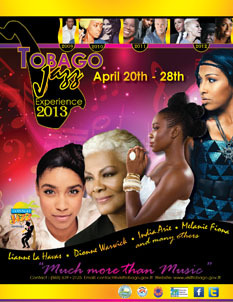 The jazz festival not only features jazz music but also R&B and Calypso. Experience 13 days of masquerade, drummers, quadrille dancers, traditional musicians, traditional fashions, carnival features, visual arts exhibitions and many culinary treats. Performances held at historic Pigeon Island National Landmark, along with other scenic across Saint Lucia. This years performers: R. Kelly, Akon, The O'Jays, 4th World, ACE, Blaise Pascal, Brian Culbertson, Cameron Pierre, Carl Gustave, David Rudder, Dennis Rollins Velocity Trio, Eric Ildenfonse, Etienne Charles, Fal Frett, Fatoumata Diawara, Harvey Millar, JC Maillard - Grand Baton, Karen Briggs, Kréyol Project, Manjé Kwéyol, Meddy Gerville, Ronald Hinkson, Robert Greenidge, Roberto Fonseca, Tanya Saint Val, The John Scofield Überjam Band, Tito Puente Jr., Tony Allen, Tracy Hamlin. The Tri de Spice Grenada International Triathlon attracts athletes of all ages from various parts of the world to participate in this fun, challenging and highly competitive event. 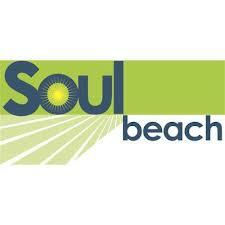 The 2013 Soul Beach Music Festival kicks-off Memorial Day Weekend with five-days of power-packed events. Join Soul Music Lovers from around the world and take part in amped-up nightclubs, sizzling beach parties, music and comedy concerts. This year's festival performers include Ne-Yo, D'Angelo, Sinbad, Elle Varner, Tamia, and Damon Williams. "Beats by the Bay" where the sounds of music meet the sounds of nature. 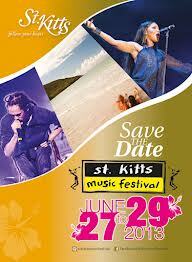 The festival features world-renowned artists on the beach front at Cane Garden Bay, Tortola, British Virgin Islands. 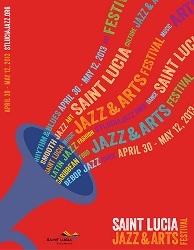 17th Annual St. Kitts Music Festival attracts both locals and visitors alike - announcements of performing artists for the 2013 event will take place over the next few months. Each year, the Festival features a wide range of musical styles on the popular music scene including R&B, Jazz, Hip-Hop, Reggae, Soca, Calypso, Gospel and Contemporary music, while reflecting a uniquely Caribbean flavor. 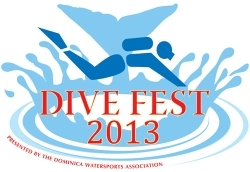 Dive Fest is an annual event sponsored by the Dominica Watersports Association to focus attention on the sport of scuba diving, to educate the public about Scuba Diving, and to raise awareness about Dominica's stunning and unique marine environment. Along with these events for divers, there was plenty of excitement for non divers too!